Garden Igloo – Stylish Conservatory, Play Area for Children, Greenhouse or Gazebo. How big is Gardenigloo? 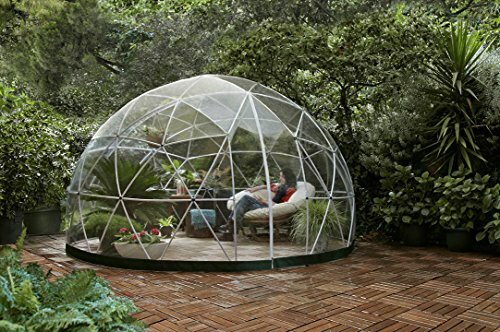 Gardenigloo has a diameter of 11′ 9″. Max height is 7′ 2″. Base area is 107 ft². What materials is Gardenigloo made of? The Garden Igloo® structure is made of non-corrosive, 100 % recyclable PVC and PA6 materials. The transparent cover of Garden Igloo® is made of cold-resistant (-4°F) transparent soft PVC. Protecting it against excessive UV exposure and keeping it clean before storing will increase the life span of the cover. What is the wind resistance of Gardenigloo? Under proper conditions* Gardenigloo withstands strong wind conditions (Beaufort scale 6 – approx. 31 mi/h. What is Gardenigloo’s snow load capacity? Gardenigloo can bear up to max. 90 lbs of snow. If the snow on the dome reaches 6″, you should remove it with a broom or similar tool in order to prevent damage to Garden Igloo®. What is the UV – heat resistance of Gardenigloo? Gardenigloo’s structure is stable between temperatures ranging from -4°F to +140°F and withstands exposure to sunlight of up to UV index 5. In winter close the windows and the dome will heat up several degrees, especially when it is very cold but the sun is out. It is also ideal for cutting out the wind chill factor. It will require roughly 40 % less heating in winter than a standard greenhouse due to the geodesic shape. This is due to its low volume for its base area and the fact that its surface is always at right angles to the sun’s rays even in low winter sun, heating it up naturally. MAXIMUM SOLAR GAIN – Sunlight is always transmitted at right angles throughout the day for four seasons. OPTIMAL AIR FLOW- Excellent air flow is maintaned even in warm, still weather conditions. The heat inside is distributed evenly at all points. UNIFORM TEMPERATURE- The geodesic dome form is superior to conventional shaped rooms in sustaining better airflow and a uniform temperature inside. WIND AND SNOW RESISTANCE- The geodesic form of the dome allows for the most robust design possible to withstand the strong wind (up to 31 mi/h) or lying snow conditions (max. 90 lbs).